A couple of days ago I bought an ATI Radeon 3650 AGP 512MB. It is hard to find an AGP card these days. The other contender was an NVDIA 7600GT 512 MB. I got the ATI one despite my good judgement because it looked better on paper(higher clock speed, DirectX 10.1 support and HD hardware decoding) and was 25 euros cheaper. My initial reactions were good and i was happy about my desktop use and video decoding but when I tried a game everything changed...it simply would not work correctly. The official ATI Catalyst drivers would not even install. Most games would crash gving me a Blue screen of death. Some would not even load. Even if they did load they would be slower than death. It was absolutely horrible. After some googling I found out that the ATI AGP cards of the last year, or so, have a really bad agp implementation in comparison with their PCI Express equivalents. I read through many forums where poeple where having the same problem as me with their ATI agp cards 3650, 3850 and some 2000 series. There is a hotfix driver aimed for those cards but it did not work for me. It did not work for many other people as well. Some managed to solve the problem, while other solved it only partially. I tried every method mentioned with no effect but apparently it has something to do with the catalyst versions. Some older versions work better than the current one (8.12). Having a Graphics Card that previous drivers work better than the current ones is unforgivable. ATI drivers in the past sucked in comparison to the NVIDIA forceware but I thought that it got better. Well....it did not, at least for the AGP implementations. If you are not going to properly support it do not even market the damn thing. One stop at the Catalyst Official forum will persuade you about the bad quality of these drivers. NVIDIA 7600GT to the rescue. After many hours of trying to fix it I realized that future drivers might be either better or worse and that these problems are more than 1 years old and ATI still has not addressed them correctly. I decided that I should return the card back to were I bought it. 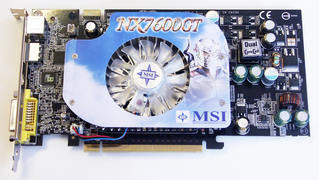 This morning I went back to the store explained to them the situation, returned the card and ordered the NVIDIA 7600 GT: tried and trusted AGP drivers. The 7600GT AGP arrived. I installed it and everything runs just fine. By the way, much easier to get everything running on Linux as well.Take that ATI. NVIDIA for the win! I have the HIS version of the 3650AGP and have had no problems with it what so ever. I used the drivers on the CD (naturally) and everything runs perfectly on my old P4-3GHz@3.6. If you downloaded the 8.12 directly from ati.amd.com just stating that you run a 3650 GPU it will give you the pci-x version and that driver won't find compatible hardware. I thinks it has been that way with many AGP cards lately - you'll only get stability with drivers modified by the card vendor. I tried the manufacturers drivers as well. They had the same problems. The ati drivers did not even install. I tried the hotfix drivers but they did not work either. I think that the rate of success with the different drivers depends on the motherbord as well. For example from the various forums I visited the people with the most problems had nForce based motherboards. Yes I recently went through the 3650 agp ordeal myself. Computer would not get past boot screen. Hotfix drivers upgrade to v8.5+ helped - thanks to local computer shop and 3 days of dinking around with it. Now it works fine but if computer isleft off for several hours it won't get past boot screen. Have to unpug video card power to revive. give me my bullet proof NVIDIA back!